Kuwait: Held under the patronage and with the presence of His Excellency, Sheikh Salman Sabah Al-Salem Al-Homoud Al-Sabah, Minister of Information and Minister of State for Youth Affairs, and with the sponsorship of the Kuwait National Fund (KNF), the highly-awaited first edition of ArabNet Kuwait will take place next week, on October 4-5, 2016, at Arraya Ballroom in Kuwait City. The exclusive event is set to gather over 500 digital leaders and decision makers from Kuwait, the GCC and the world, to highlight the state of digital economy and business in Kuwait, delve into the latest trends in web and mobile, and showcase top entrepreneurs while hosting hands-on workshops to hone local talent. The 2-day conference will feature over 50 high-caliber, international and regional speakers, who are themselves initiators of change, and ready to introduce the latest into Kuwait and MENA. Her Excellency Shikha Al-Zain Al-Sabah, the Undersecretary of State for Youth Affairs, will shed light on the entrepreneurship ecosystem in her home country. Other joining speakers include Abdulla Alajmi, CEO at Knet (the national e-payment system in Kuwait); Andrew Hyde, Director of New Programing at Techstars; Lloyed Lobo, Chief Growth Officer at Speakeasy.co and Co-Founder at TractionConf.io and Boast Capital; Sharif El-Badawi, Partner Lead – VCs and Startups at Google and Venture Partner at 500 Startups; and Yaser Bishr, Executive Director of Digital at Aljazeera Media Network. A high level agenda is set to tackle 3 key themes this year, online media, digital entrepreneurship, as well as e-commerce and payments. Panel discussions and talks will cover topics such as social media platforms and trends, native and programmatic advertising, video content, as well as the entrepreneurship and investment landscapes in Kuwait and the region. “ArabNet aims to stimulate the growth of the Kuwaiti digital sector by helping companies stay ahead of the latest technologies and trends, and connecting promising startups with investors and clients” said Omar Christidis, ArabNet Founder and CEO. Workshops will target startup founders to boost their businesses, while ArabNet’s signature competitions, Ideathon and Startup Demo, will provide the opportunities for entrepreneurs to showcase their ideas and/or companies. 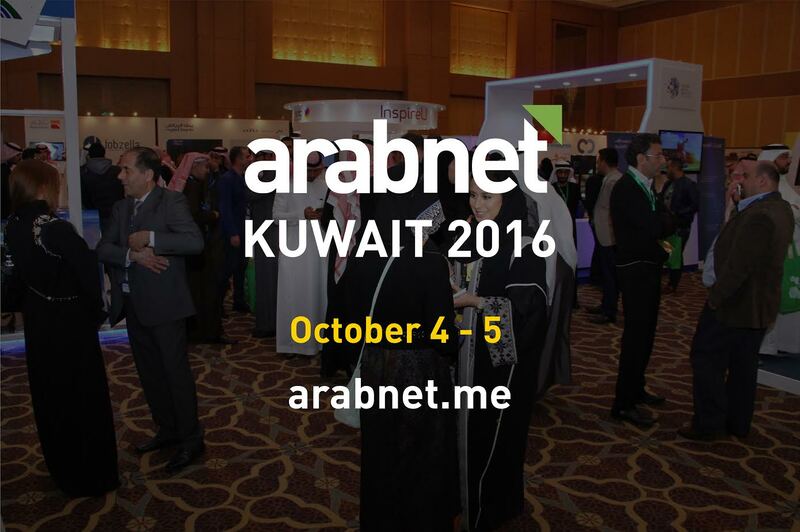 The ArabNet Kuwait 2016 conference will be held on October 4 – 5 at Arraya Ballroom, on Al Shuhada Street in Kuwait City. Past ArabNet events have notably attracted top speakers, participants, and partners from corporations such as Smart Dubai, OMD, Souq.com, Du, Touch, Alfa, TBWA, Facebook, DMS, Majid Al Futtaim, JWT, STC, Twitter, Starcom, Criteo, SkyNews, VISA, Leo Burnett, Deloitte, LBC, Microsoft, Uber, Vivaki, GE, MakerStudios (Disney), FP7, 500Startups, International New York Times, and many more. ArabNet is the hub for Arab digital professionals and entrepreneurs, creating online and offline platforms for them to connect and learn. ArabNet’s vision is to grow the web and mobile sectors in the Arab region. It also aims to build business bridges across the MENA, stimulate the growth of the Arab knowledge economy, and support the creation of new businesses and job opportunities for youth through conferences, partnerships, and competitions.